GoToWebinar is one of the more challenging tools to set up, but, once completed, reusing preferences and settings is very easy. Customization of the GoToWebinar tool is one of the greatest benefits, including the multiple other features such as polls, quizzes, and reports. Setting up these features can be time consuming, which should be considered when deciding if this tool is right for your organization. Setting up GoToWebinar is slightly more involved. GoToWebinar is a bit more complicated to set up than some of the other online meeting and training tools, but that is largely due to the number of options offered. However, the options and preferences utilized for one webinar can be saved for future use. Preferences include choosing template colors and inserting your organization’s logo. The attendee registration page can also be customized to ask attendees whatever questions you would like. Once preferences have been set up, enter a title and description of the meeting or training as well as the time the event will start. GoToWebinar allows for multiple presenters to take control and show their own screens. The next step is choosing an audio service. GoToWebinar provides a call-in number, but it may be considered long distance depending on where the attendee is located. Additionally, the quality can be rather poor, so this option is not recommended. If you would like to use a 1-800 number, you can set up service with AT&T or Civicom. Once you set up your webinar, you are provided a URL to send through email or put in a newsletter. You can also set up automatic email notifications for attendees to receive at the specified time you request. GoToWebinar features include polls, quizzes, and surveys. One of the greatest benefits of GoToWebinar is that you can develop your own polls to display throughout the presentation to keep attendees engaged. Typical polling questions are multiple-choice or multiple response and could be used to gauge interest or knowledge on a topic. Responses are real-time, so you can see how many people have answered before closing the poll to show the results to all participants. Polls are especially useful when you see the attentiveness rating dip. Attentiveness ratings show when attendees are not on the webinar page. They could be possibly surfing the web or reading email. Another way to keep attendees engaged is through the chat box. If you intend to use all of these engaging features, it may be beneficial to have two people running the session: one person to focus on content delivery and one to focus on managing polls, quizzes, and questions. You can also set up a quiz or survey with a total of eight questions that can be open-ended, multiple-choice, or scaled. This survey will be sent at the end of the webinar and can function as an evaluation of your training. Within GoToWebinar, you can also record your training; however, a drawback is that the tool does not host the training on their website like Yugma. Recording files are typically quite large and would most likely require conversion to another file type before posting to your own website. This might require the skills of a technical programmer or administrator of your website. Finally, the last benefit of GoToWebinar is the reports that are provided after your webinar is complete. The reports include registered attendee information, login time, and duration on the webinar. This can be evaluated to determine at what point people dropped off. It also provides questions asked per attendee, which makes it easy to circle back with participants after the webinar, if needed. Additionally, the report shows attendee attentiveness level. You could set a minimum required attentiveness level if you are certifying attendees through a virtual training. It should be noted that just because the webinar screen is up, it does not account for people on the phone or having side conversations. Finally, reports also indicate poll or survey responses. GoToWebinar is a flat fee for the month, so you can use it as many times as necessary. A monthly subscription is $99 for 100 attendees. Remember to keep in mind the savings on gas, hotel, food, and time compared to executing in-person training when evaluating the cost of these tools. The cost speaks to the fact that the system is a bit more complicated to use, but this is because of the many options available. GoToWebinar offers a free one month trial so that you could try it out to determine if the many options are worth the cost. Security rating for GoToWebinar is low, even if you elect to have the password protected option. Consistent with the other tools, you should not have any confidential materials discussed or reviewed during your webinar. In terms of administrative skill required for setup, it is similar to Yugma. For the user, the required skill is lower and is synonymous with someone who is comfortable surfing the internet. In terms of key benefits, the customization is very nice and the tracking of registration information, attention level, and polls is also a great benefit. The capability to record a session is also nice; however, keep in mind the limitation discussed about posting the sessions due to file size. For drawbacks, just like with Yugma and Zoho for large group training, you may have to set up a separate conference call line. Additionally, you may need extra equipment for recoding the questions and conversations that occur over the phone. GoToWebinar has a tool that costs $50 that connects your phone to your computer so that it synchronizes the audio with the imagery. Access the GoToWebinar website here. Dimdim is slightly different than the other tools available today due to operating completely within the “cloud.” Therefore, Dimdim requires no downloading and takes seconds to setup and begin a meeting. Dimdim is a simple web conferencing service that combines the most efficient tools available by coupling them with speed and low subscription costs. It's an innovative solution, combining features such as audio/video conferencing and desktop sharing. Dimdim has more packed into its tool than most other tools offered today. Signing up for Dimdim takes only seconds and meetings or trainings are easy for attendees to join. Dimdim is slightly different than the other tools available because it does not require installing software. It is housed completely in the virtual "cloud." The registration page only requires a few pieces of information, including account type, username, email address, and password. You will be sent an email, but confirmation is not required. Once set up is complete, you can begin organizing meetings. This process only requires you to enter and determine a few key elements of your meeting. These include meeting name, attendees, time, date, and recurrence. During this process, you also have the option to set a few more preferences for the meeting, such as audio and video setup, resources provided to attendees, and, finally, creation of a widget for posting. Attendees receive a link to join the meeting, which includes all necessary information and the ability to add the meeting to Outlook. From there, the attendee is only a click away from joining the meeting. They do not need to download any applications or prepare their computer. Dimdim has many benefits, including embedded video conferencing. Dimdim prides itself on being the best of all the web conferencing services by taking the most efficient tools available and combining them with speed and low costs. With no software to install, users can set up a meeting in seconds. Instead of setting up a full meeting, Dimdim also provides a short, permanent URL to each user through the myScreen feature that lets guests view the host’s screen as soon as the hosts opens it up. 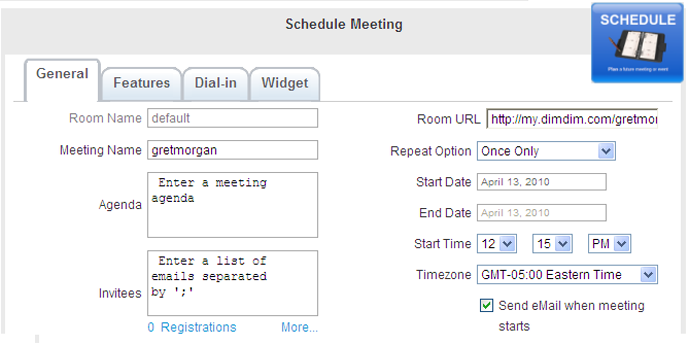 When sessions are not occurring, Dimdim provides a profile page that can display future meetings and capture registrations. Similar to some of the more advanced tools, Dimdim has the capability to share and annotate documents as well as collaborate using the whiteboard feature. Each meeting can have several presenters and allow attendees to chat both privately and in a group. Additionally, Dimdim provides free audio conferencing services. Regular long distance rates apply. For the more advanced Dimdim features, Pro, Webinar, and Enterprise versions include high-quality microphone and webcam sharing. Also included, similar to GoToWebinar, is the ability to customize a meeting with a logo and brand colors, but this does require some programming capabilities. Dimdim also can create a widget to embed in any website to invite people to register, provide countdown timing to a meeting, or show recordings and transcripts. Finally, the tool can also provide analytic reports of when attendees registered and arrived and how many questions they asked. This tool boasts having all the ideal elements combined from various other tools currently available on the market. Along with the many benefits of Dimdim come a few drawbacks. Dimdim has many features of the larger tools available for web conferencing at a much lower price. They have a free version for up to 20 participants and $25 for 50 participants. The Dimdim Webinar version is $75 for 100 participants and the tool also offers an Enterprise version, which can be used for up to 1,000 participants. The other concern that seems to plague many of these tools is the security. The free Dimdim application security level is very low, especially within the text chat windows. The upgraded versions, such as Pro and Enterprise, do provide additional monitoring of the program to ensure a higher level of security, but with any of these tools it is not advised to share any confidential information at anytime. Some of the Dimdim concerns include poor voice quality, which also impacts the recording quality. Along with the audio, there has been a reported video delay among participants. Additional concerns for some users include the lack of embedded polls or surveys. Dimdim suggests creating external polls in a site such as Micropoll or Surveymonkey and then displaying the direct URL within the Dimdim meeting. Although this does seem to resolve a potential need for some users, another feature that is not available is the raised hand feature that allows the host to control two way communications on a larger conference call. Finally, the other drawback of Dimdim is the inability to load a meeting in advance with necessary documents for sharing. Although this can be done rather quickly within the tool, the ability to prepare in advance is a nice feature of some of the other tools available. Additionally, once a document is loaded, the viewing screen is sometimes smaller than expected, causing viewing difficulty. As with any of these tools, it is advised to review the various options and match them with your needs. Access the Dimdim website here to find out more on your own. The next step will be to select and implement the right technology tool that fits your business needs. There are a few pitfalls you will want to avoid while choosing the right tool for your organization. The first pitfall to avoid includes failing to conduct research around previous user experiences. Ratings of the product and comments from people or organizations that have used the tool can be very insightful. Second, you want to avoid choosing a tool based on a surface-level review. Avoid making a decision based on what looks flashy or sleek—the bells and whistles—versus what your organization actually needs. Finally, steer clear of pushing the use of a tool down from the top, without any kind of buy-in, training, or involvement from the end-users. All of these pitfalls are common when choosing a new technology tool and will result in an expensive system that no one uses. A three-step process of conducting research, methodically comparing technology, and committing to controlling change management can help you implement a technology solution. Utilizing the resources available and creating an action plan will also result in success. Before implementing a tool, you’ll need to identify and understand the needs of the people who will use it. These people include your volunteers or partners. Also, identify anyone else who is going to be impacted by your decision, such as the consultants, clients, or even the board of directors. These people are your key stakeholders. Finally, you will want to identify your budget. Several tools are either free or low-cost; however, the amount of time it can take you to set up and run the tool can actually make the tool more expensive than some of the tools that have a subscription cost. Once a tool is chosen and the adoption phase begins, you will need to involve key stakeholders in the beginning to help manage the change. Many players are involved so you must identify and mitigate possible risks, including refusal to adopt the tool or volunteers and partners not showing up. Evaluating risk includes identifying the likelihood of an event occurring and the resulting negative impact. Next, think about how to communicate the decision to implement a new technology and how to get people involved. What are you going to say to your stakeholders? How will you communicate? Is it going to be a series of emails, is it going to be in a meeting, or is it going to be in a newsletter? Finally, who is going to roll this out and who can answer questions? This is where your end-user pilot advocates will come into play. Also, you can identify people who you believe will be early adopters to have them be part of the rollout plan.